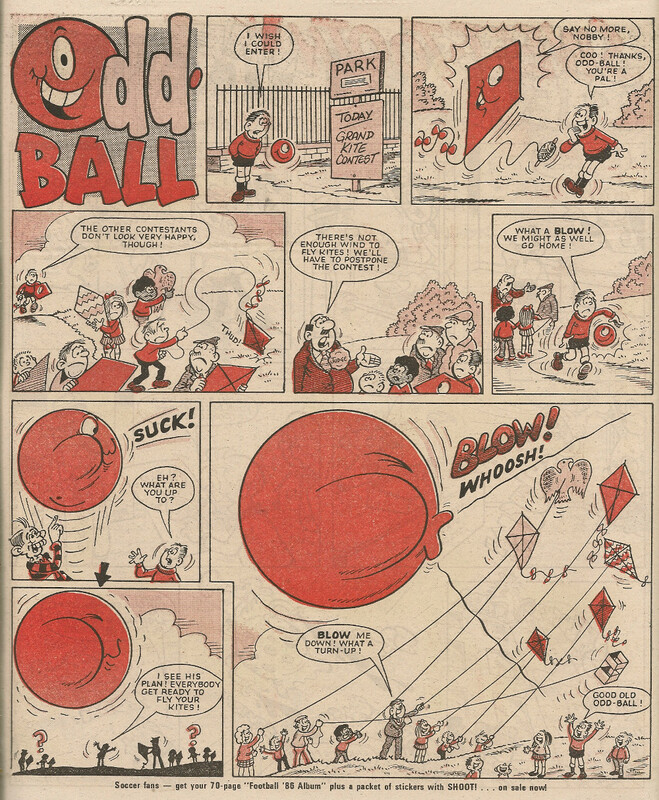 In the same way that comic readers of the 1970s were familiar with the big names in comic publishing (IPC, DC Thomson, Marvel, DC), so were the consumers of sweets (very often overlapping in the Venn diagram of newsagent patrons) aware of the manufacturers of their favourite treats. Rowntrees, Trebor, Mackintosh, Cadbury, Mars – mention of these names would bring on a craving for something sweet and either chewy, crunchy, chocolatey, minty or else fruity and boiled (or possibly, in the case of those with generous pocket-money allowances, a combination of all the above). There was yet another titan of the enamel-eroders; Bassett's. 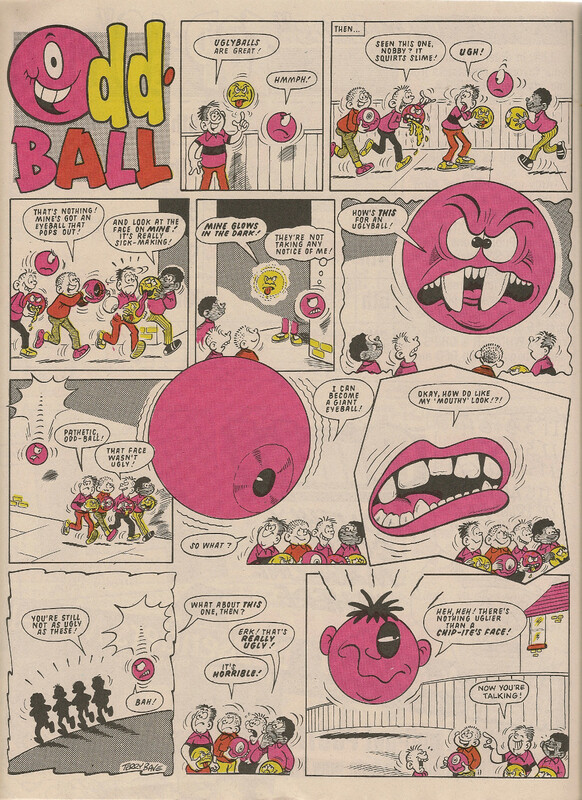 Bassett's were probably most associated with their iconic Jelly Babies and Liquorice Allsorts, but the company's ads in Cheeky Weekly focused on a range of pre-packaged confectionery clearly aimed at the younger end of the sweet-buying market. 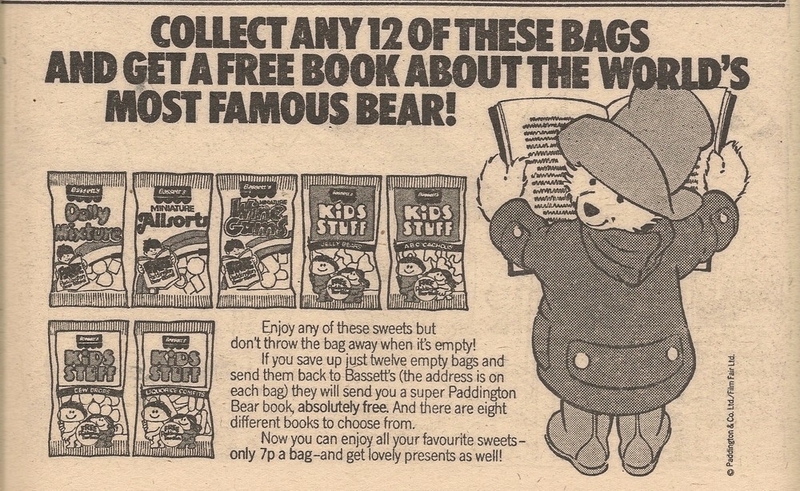 Running during the latter half of 1978 for a total of 5 times, the adverts (all identical) alerted readers to a promotion whereby 12 empty bags from the range could be exchanged for a book featuring Paddington Bear. The marmalade-loving ursine immigrant had been appearing in children's books since 1958, but in 1975 he made the leap to the small screen in a high-profile animated series, and Bassett's no doubt hoped to capitalise on the resurgent interest in the character. 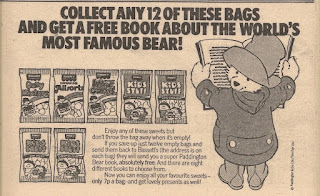 It seems those who survived the sugary onslaught necessary to accumulate the requisite 12 depleted packs were able to specify which Paddington book they required from a selection of 8. 11 tomes relating the misadventures of the furry, hat-sporting Peruvian had been published by this time, but maybe the books on offer were specially produced for the purposes of the promotion – despite an exhaustive search of the internet (lasting almost 3 minutes) I've been unable to source any further information regarding this ad campaign, so we'll probably never know. Similarly-named sweet manufacturer Barratt ran a short promotion in September 1979 relating to their Oran-gee-tang nougat bar. Were you one of those kids who pronounced it 'nugget', or did you use the posher-sounding 'noogah'. I must confess I fell into the latter category. 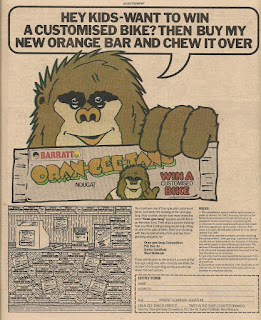 Like Basset's, Barratt chose to anthropomorphise their campaign, but in this case it was an unknown primate of their own devising, looking more like a gorilla than the orangutan it was presumably supposed to resemble, who was chosen to head up the promotion. 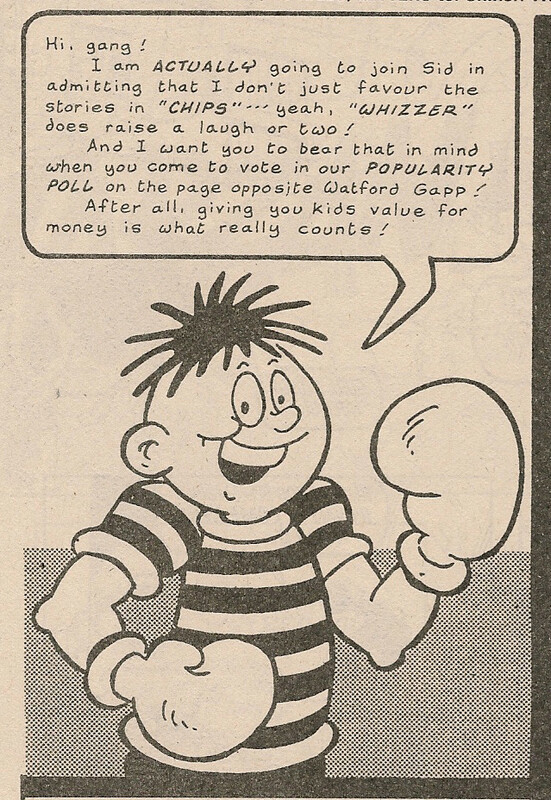 Unlike Bassett's, Barratt chose to place full-page, colour ads, although the Barratt campaign was much shorter. 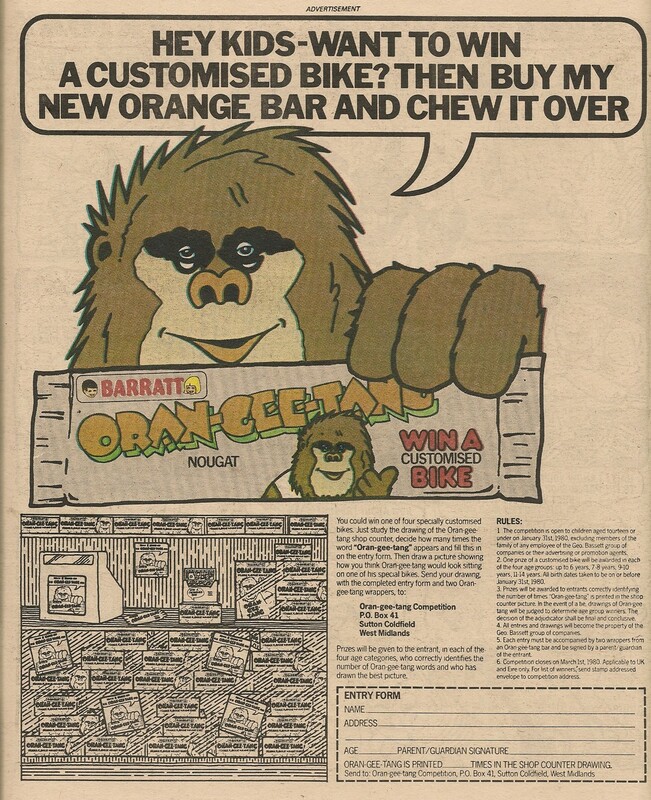 Barratt required of their respondents less exposure to tooth-rotting materials than their rival, as just two wrappers from the rainforest-inhabitant-referencing, filling-loosening comestible would facilitate entry into a competition to win a 'customised' bike. Again the ad is somewhat lacking in detail, giving no indication as to the nature of said customisations. Possibly a giant, flashing fibreglass Oran-gee-tang bar attached to the handlebars – once more the internet fails to furnish enlightenment. 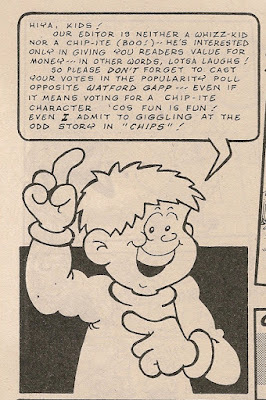 If you've been following my series of posts entitled Whizzer and Chips - The Cheeky Raids, you'll be aware that Whizzer and Chips was from the outset designed to have the appearance of two comics in one. The editor encouraged a friendly rivalry between those readers who favoured the contents of Chips and those whose tastes tended toward the strips comprising Whizzer. 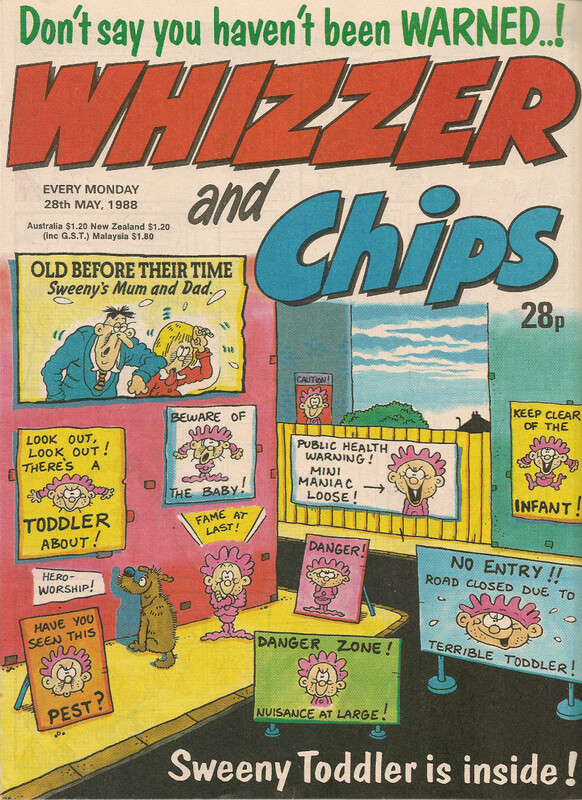 Readers were invited to separate the Chips section from Whizzer, though I doubt many who read it actually went to the trouble of extricating one 'comic' from the other. 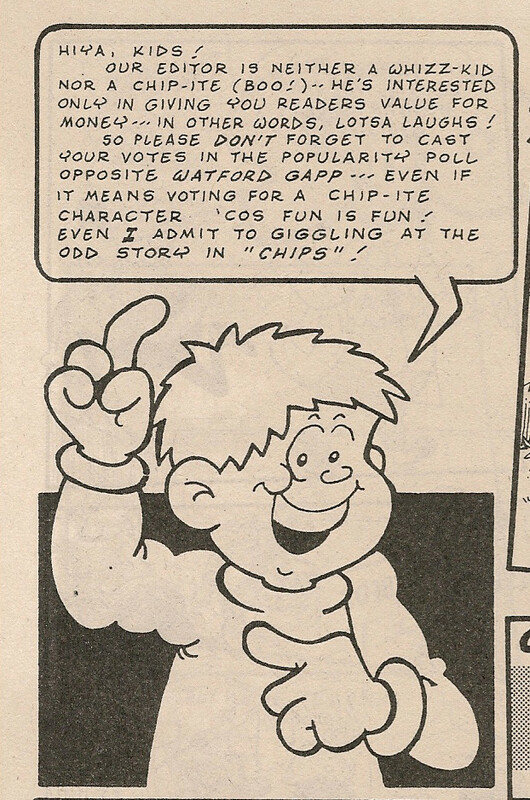 But the strategy of setting Whizz-kid against Chip-ite, fuelled on the letters pages of the respective 'titles' by Sid (Whizz-kid leader) and Shiner (Chips' supremo), was not without its risks. If readers took things a bit too literally it could result in them ripping out and discarding unread whichever section they found offensive. If their weekly W&C was parentally funded, such action could result in a "Well, if you're going to throw half the comic away I won't buy it for you any more" scenario. To combat this, a clever ruse was instigated early in the comic's run. 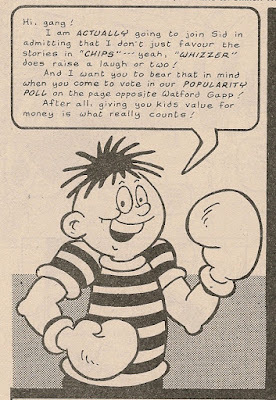 In each issue, a character from the Whizzer section would appear somewhere within Chips, and vice-versa. 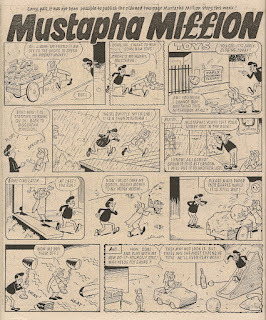 Readers were encouraged to locate and obliterate the interloper from the rival section, but they would also be keen to find the character from the section they supported who was appearing within the pages of the 'rival comic'. Thus even the most resolute Chip-ite or fervent Whizz-Kid could be persuaded to peruse, and surreptitiously enjoy at least part of, the less-favoured portion of the publication, ostensibly to locate and cheer on their intrepid invader. 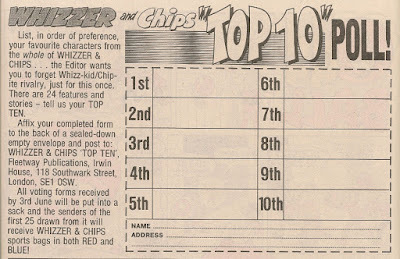 Whizzer and Chips dated 28 May 1988 makes it evident that the pitting of Chip-ite against Whizz-kid had another drawback. 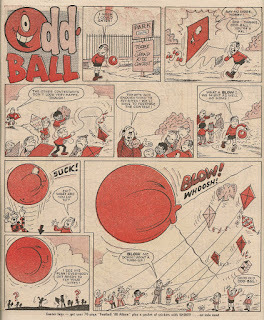 Gauging the popularity of the individual strips was clearly vital to maintaining healthy circulation figures, but unlike today's interactive world, there was no easy way to garner feedback from those who made up the comic's audience. I was surprised when I read Terry Bave's autobiography to find the amount of audience research that Terry and his wife Shiela undertook before launching a new strip. I have no idea how common it was for those in the comic business to obtain feedback from school children in the way Terry describes, but I'm guessing it was not a regular occurrence. 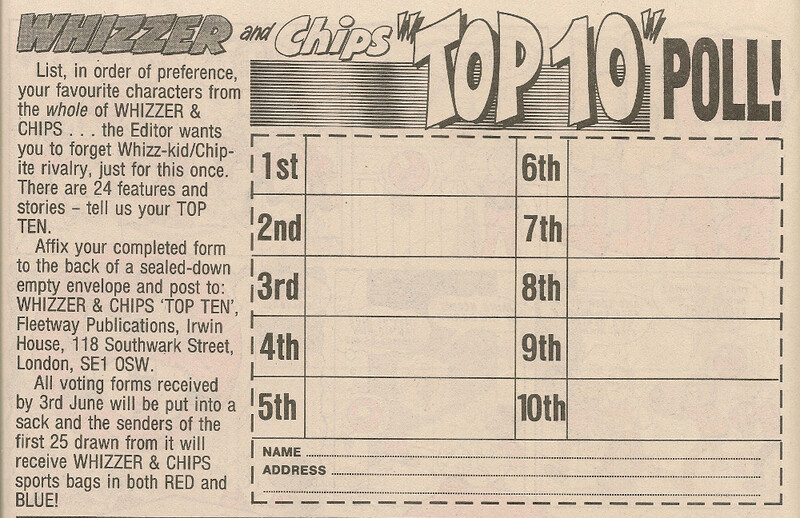 What was a common sight in comics of the time was the 'let us know which are your 3/5/10 favourite strips' coupons which readers were regularly invited to complete and post back the the editor. By the time of this issue it would appear that concern was beginning to arise in the office that readers may be allowing their devotion to one or other parts of the comic to colour their coupon responses. 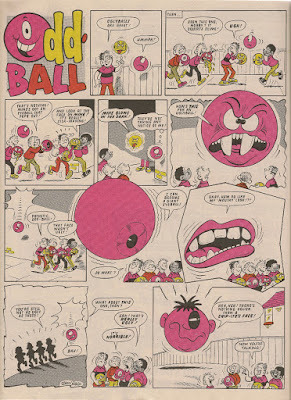 Thus for this issue Sid and Shiner adopted an uncharacteristically conciliatory tone, to try and encourage an honest appraisal from readers of the comic's most popular content. The regular rivalry resumed in the following issue. Typing Mi££ion requires a bit more thinking about than the conventional spelling. Forcing my fingers to formulate the curious 'Shift and 3' configuration that will cause the iconic currency-denoting symbol to appear on screen slows my words-per-minute count which is already pretty poor due to my two-digit keyboard manipulation. Thus I choose to use the conventional spelling to save a bit of time. While it looks ok in the comic, Mi££ion just looks very odd in whatever font blogger defaults to, causing it to look a bit like Miffion. In the first episode we learned that Mustapha had inadvertently struck oil in his homeland as a result of over-enthusiastic hammering on a tent peg while setting up camp in the desert. 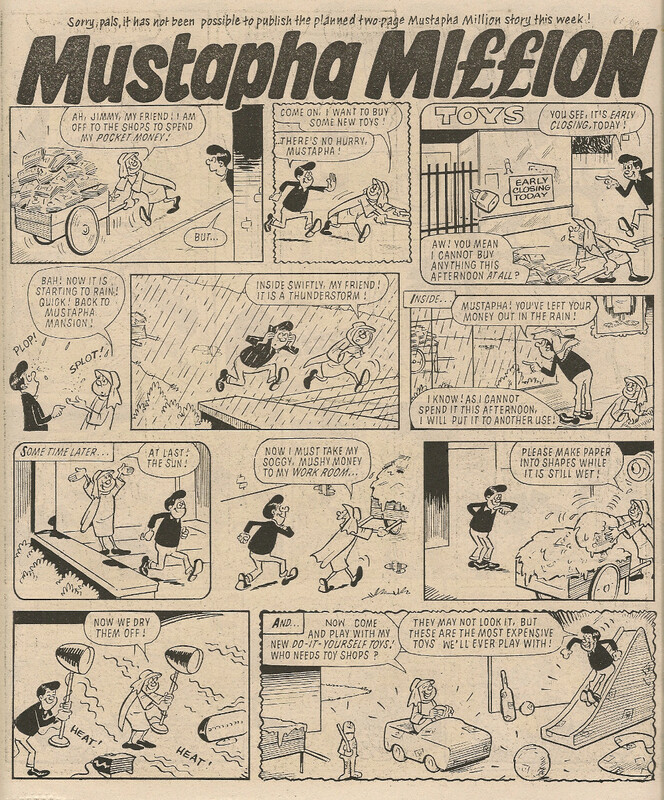 Although his oleaginous wealth didn't originate in the UK, the use of pound signs in the Mustapha title frame was entirely appropriate because our moneyed mate was, for the duration of his comic adventures, living in good old Blighty and therefore his frequent distribution of large amounts of cash (no anti-money-laundering regulations to worry about in those days) was very likely mostly transacted in sterling. Someone made a bit of a slip-up when composing the cover of Cheeky Weekly dated 01 September 1979, as the banner at the top of the front page reads 'Bionic Action with 6 Mi££ion Dollar Gran - Inside!'. Apart from the fact that they used the wrong currency symbol, they also forgot to take account of the GBP/USD exchange rate. 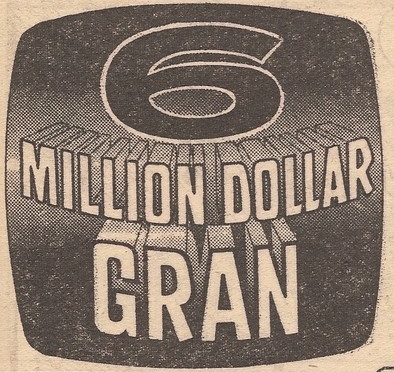 This online historical converter suggests that on 22 October 1977 (cover date of the first Cheeky Weekly and my presumed date of her dollar valuation) a more accurate description would have been Three Mi££ion, Three Hundred and Eighty-Eight Thousand and Fifteen Pounds and Ninety One Pence Gran. 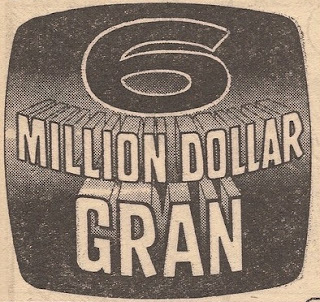 Of course, setting aside the exchange rate issue, if they'd spelt it with the more appropriate dollar signs that would have made the title read '6 Mission Dollar Gran' which doesn't make sense. This April Fool's day finds the internet awash with the toothy funster - well, 2 blog posts, anyway. 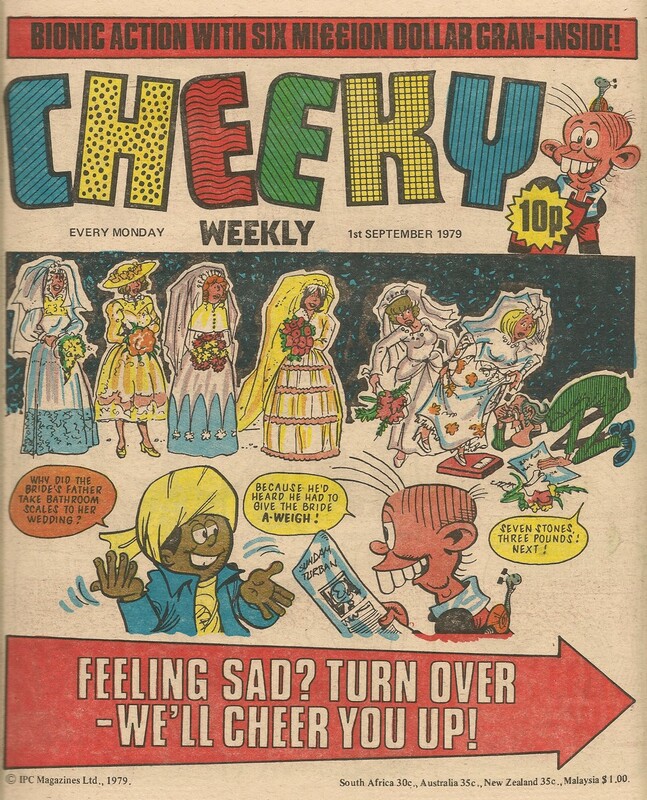 Coincidentally both posts are focusing on the 1978 edition of Cheeky Weekly which carried the fateful date on its front cover (seeing as the comic lasted for only 117 issues sadly there's not many April Fool editions to choose from!). Here's Bruce's take on the issue, and here's the Great News analysis of the April foolery.